Our Weekly Time Cards are OEM quality approved and made with the 150Lb. Card Stock for durability and resistance to moisture. The manufacturing process employeed to produce these Time Cards includes Rotary Cutting for proper sizing and accuracy, ensuring Outstanding performance when utilized in your Bi Weekly Time Card machine. Don't settle for an inferior Bi Weekly Time Card...that could result in problems with your time clock equipment. For time cards of the bi-weekly variety, TimeClockeShop.com has a variety of options from leading time card brands. Printed on 150 Lb. 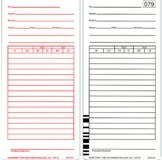 manila card stock, many of these time cards are designed for outstanding performance in your bi-weekly time card machines. If youre using inferior time cards, your time clock equipment could easily be susceptible to a range of problems so be sure to select the bi-weekly time cards that correspond to your time clocks brand and model number. Precision rotary cutting guarantees proper sizing of the cards and size accuracyensuring your time clock machine will accommodate the cards with maximum efficiency. All of our time card options are offered with free shipping and are OEM quality approved so you can be sure they represent the best cards in the industry. For the finest bi-weekly time cards, browse our wide selection at TimeClockeShop.com and find the time cards for your system today.